In honour of none-other-than Iggy Pop joining 6 Music's presenter roster, Tom Robinson invites 6 Music listeners to create a special playlist celebrating the life and work of this inimitable music icon. As Iggy commented on his official twitter feed @IggyPop after Jarvis announced the news on BBC 6 Music: "A great intro by Jarvis Cocker. You'll be hearing more of Iggy on the @BBC6Music #iggypop #radioshow". He's excited, we're very excited. We definitely won't be chairman of the bored listening to him.. ahem. We don’t need reminding you that the man born James Osterberg is credited as one of the inventors of punk rock via his band The Stooges as well as providing the inspiration for helping kick-start Bowie's career. Add to that his mesmerising (mostly bare-chested) live performances and Mr Pop is among a hallowed few who truly deserve the moniker of "music legend." His work with David Bowie who helped write and produce Iggy's two most successful and acclaimed solo albums 'The Idiot' and 'Lust For Life’, as well as writing 'China Girl', ‘Tonight', and 'Sister Midnight' together. All of which Bowie performed on his own albums later on. These are simply a poker to stoke your thought fire: any other weird and wonderful song suggestions are welcome. 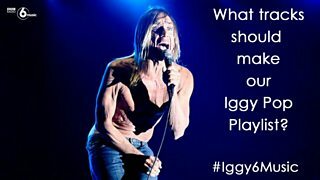 Get your choices to us using #Iggy6Music on twitter, comment under this post or on our Facebook page, email nowplaying@bbc.co.uk, or drag tracks onto our Spotify and Rdio playlists. But remember to include a reason WHY you are suggesting a particular track. #Haim6Music – What tracks should the girl group pick for our all-female playlist? #KateBush6Music - what must be in the Ultimate Kate Bush Playlist? Help us create the Ultimate Playlists! You can add comments here, on Facebook, Twitter or by email. We've moved to a shiny new blog, but you can still view Now Playing's older blog posts.